Rated 5 out of 5 by Tina_TX_W77 from Great Building Game All around a great building game and different with it being flowers, wish you had more of a say in fixing the house up, that part could have been better, that's about it on negatives. 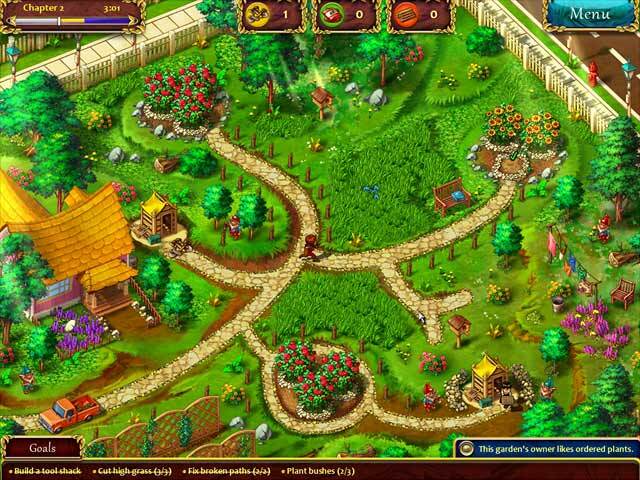 Rated 5 out of 5 by vitDmama from Gardens Inc: A Fun One I really enjoy the visuals in the game. It's beautiful and challenging at the same time....just what I like in a TM game. I can easily play this for hours. It's challenging, but not so hard that you give up. Rated 5 out of 5 by godfreygirl from WOW....this is the BEST game I've played in a long time! ....and I don't normally even like time management games. But this game is fun, challenging, interesting and every other good thing you can say about it. I play it a bit every day since I've had it. It can get more challenging when I end up buying too much wood or tools when I need bricks....so you have to "manage", which is what the game is.....time management, but this one is more that "time"....you have to also manage what you buy. But, LOVE, LOVE this game!! The one thing I don't understand is that when I upgrade something in the Villa, the looks of it doesn't change....what gives there? 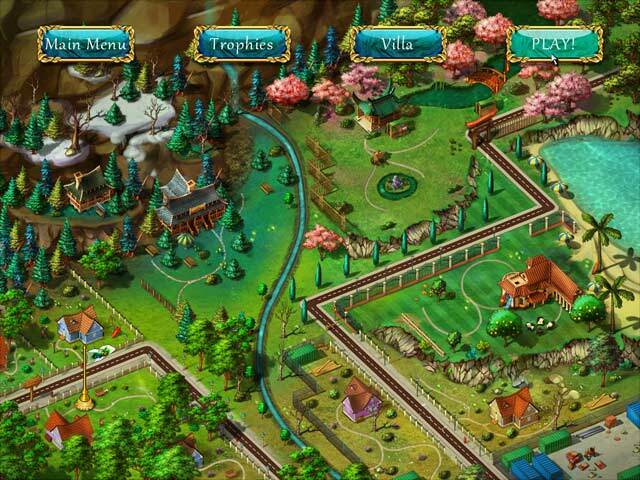 I have "Gardenscapes" and when you upgrade something there, you can see the changes. Am I doing something wrong here? Rated 5 out of 5 by Crazy_Cat_ from Great Game I wasn't sure what to expect when I tried this game, but it turned out I became highly addicted to it lol! Very fun, some levels very challenging and had to retry them several times to get gold. I was sad when I completed it! Great little game!!!! Rated 5 out of 5 by bagalley49 from Delivers and More I thoroughly enjoyed it. Just good, straight forward TM levels from start to end. No complicated instructions or redundant tutorials. I hate those TM games where they sneak in Hidden Object or Puzzle mini-games and this one doesn't have any of that. I challenge myself to strive for gold for each level and derived hours of fun from it. Highly recommended. Rated 5 out of 5 by solana2001 from Great Game! I couldn't stop playing this game. I was sad when it came to an end, in fact I played it over again. Can't wait for another one to come out. Rated 5 out of 5 by senevabu from Awesome! I have played this game everyday since I purchased it. It is very challenging to try and totally repair the villa. I would ask the developers to give us a way to earn extra money with little mini games since it is very difficult to finish each level with maximum time remaining. Otherwise, I absolutely love this game. 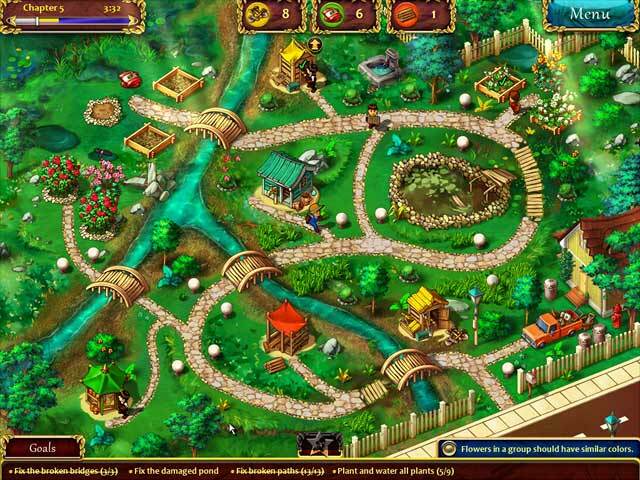 Please develop a Gardens 2, maybe with levels of difficulty and other levels of choice. Rated 5 out of 5 by Jaderi22 from Great game Really like this game! Very challenging! Enjoyed going back to get all expert levels! I bought this game! Rated 5 out of 5 by Reuiz from Great TM Game Cute graphics. Game similar like kingdom chronicles and other games i like. Absolutely cool - additional puzzles on levels. Rated 5 out of 5 by majandess from Pleasantly Surprised... I downloaded this game expecting to not be entertained by yet another copy-cat time management game. Instead, I sailed through the one hour preview, purchased the game, and loved every second of it right to the end. I was surprised by how good the story was. Right where most games end, the game kept going with its mystery, and I found myself trying to catch every hint I could as I played. Game play proved to be moderately challenging. I underestimated the game's challenge level and thought I'd dislike it because it was too easy. Surprise, surprise! Strategies are needed. Not every level was a killer challenge, but then, personally I get discouraged if I don't succeed every now and again. I felt this game was the right mix of easy breezy levels and levels that took a pile of replays. I liked the ability to fix up your grandparent's house and turn it into a fantastically awesome place. That was a nice touch similar to games like Gardenscapes, but I like time management way more than hidden objects. I thought the graphics were cute and easy to distinguish. I thought the music was appropriate and kinda catchy. All in all, I totally loved the game! Rated 5 out of 5 by keldra1024 from lots of fun You can earn gold, silver, or bronze, depending on how long it take you to complete the level. There is also a bonus puzzle on each level which gives you a ribbon if you solve it. However, the bonus does not prevent you from earning gold or proceeding to the next level which I really liked. I do wish there was something on the road map that indicated whether you had earned the bonus. Rated 5 out of 5 by Elantra711 from This Isn't Just a Gardening Game I love this new TM game. I almost didn't check it out, because I don't like gardening games. This is a TM game with a gardening twist. I just wanted to add my 5 stars, because this is such a well developed TM game with a fun storyline. Each level adds something new and different. It has not been easy for me to win Gold on most levels unless I replayed them several times (although some were fairly easy, and later on, many were downright impossible - I'm now going to the Forums). Great game. I also love earning money to upgrade the poor dilapidated villa. I encourage other fishies to try this game. Rated 5 out of 5 by xstitchcarina from Loved the game!!! Absolutely loved the game, it has a lot of challenge in it. It is timed, which I love anyways. And sometimes you really have to try hard to get it done and think ahead too and look ahead. I finished all levels gold, except level 50 for now, but that is doable. I just missed the 5th burglar alarm. Only problem is, that in some of the levels, where there is a lot to do, a lot to click and such, that the cursor starts wandering/floating. Seeming like it disappears and findind it hard to get it to where you want. But for me that has been the only problem. Rated 5 out of 5 by FlamingJune1967 from One of my favorites! After a week of playing this game for several hours each day, I have finally finished it. The game took so long because I repeated each level until I got gold... and was able to make gold on every level. I love that, because I have played games where gold was simply impossible on some levels and that is always frustrating. This is a fun game... so fun that I will probably go back to it in a few weeks and play it again. I wish there were more like this! Rated 5 out of 5 by jereswife from Nice Time Management Game You have to like those time management/strategy games to like this one, but as far as that genre goes, this may be one of the best. It has moments where it's hard enough to frustrating, but not impossible by any means. I got a good chunk of playing time from it and the storyline was interesting. It had some bugs, but I was eventually able to work around them. They didn't stand in the way of my enjoyment of the game. The music was a little annoying, but I just turned it off in the options menu. Really great buy! Rated 5 out of 5 by timemgtlvr from Definite recommend This is very addictive. Various goals are stated to be done on the level and gives a clue so you have to figure out what one of the goals is. Don't have to replay very often to get the gold where its not so extremely difficult to win and everyone likes to be able to win and enjoy and not be frustrated. Definitely recommend. 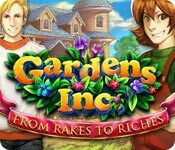 Rated 5 out of 5 by Victoria9434 from Garden Inc. From Rakes to Riches I enjoy this game very much! My only problem (and I tried looking for this game on the foram with no luck) is in Chapter 26! When I try to get the (Raven) eliminator to come over to another island to eliminate all of the Ravens, he doesn't so I cannot get to the next level (27) What do I do????? Rated 5 out of 5 by lata54 from Definitely A Winner !!! I never review games, but feel I need to this one. It has everything it takes to make a good and enjoyble to play game. Even though it is timed, which I don't like either, you can still finish the level, so I am ok with that. You just don't earn as much money. Would love to see more games with the quality, thought and skill that was put into this one. Rated 5 out of 5 by stormyrenee from Great game for all the TM lovers I liked it because of the ability to have multiple ques going. It's extremely difficult to achieve gold on every level and it's even difficult to achieve silver on every level, but it's doable. You just have to strategically plan your level.. it takes a few times to figure it out but you can get silver on just about all of the chapters. The bonus tasks were kind of hard to achieve but it just took practice trying different techniques. All in all, I really like the game.. coming from a huge fan of TM games -- there just needs to be more available that are new. Rated 5 out of 5 by MizzezJ99 from I really like it!! This is a fun game. I like the increase in challenge as you proceed. Not just the same old repetitive stuff. Rated 5 out of 5 by terry1921 from A little different I love time management building games and I own almost all of them. This one was a little bit different, the levels changed enough to keep your interest, and it was a lot of fun. I'd buy as many of these as they can produce! I wish you could earn money for renovation on the house by playing levels over, but that's just because I can't get gold on every level!! Rated 5 out of 5 by iodi from I'm a bit overrating it, due to the lack of competition The first and so far the only TM this month on BFG. That is why I am probably a bit overrating it, but only a bit. Fast paced, decent level of challenge (not always getting gold, but you can get it a second play), no obvious bugs or TM specific mistakes. Without any competition whatsoever it's a five stars. Rated 5 out of 5 by hannahzoey from Addictive This game is not one I usually play, but thought I'd give it a try. It is very addictive. Will look for more games like this.